During his lifetime he was a great ruler of his people, governing with justice and peace. He is accredited with bringing writing and books to humanity and is supposed to have written 366 books during his lifetime, including books on the Sacred Knowledge of Creation – creation stories based upon patterns of sacred geometry. He is also supposed to have taught the ‘Sons of God’ how to construct cities and brought through knowledge of the Zodiac and planets. Much of the time he lived a pious life in seclusion when not teaching. 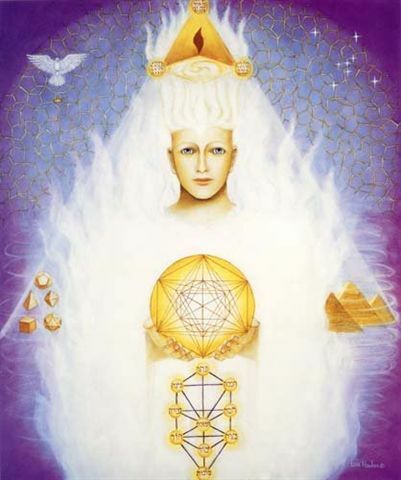 The position held by Metatron at the top of the Tree of Life also means he is attributed with being involved in Divine creation: passing the Divine blueprint for creation at all levels down to all the angels beneath him to put into place. Metatron is in charge of and actuates the sacred geometry patterns of the Universe. He holds the Metatronic Cube – a structure composed of all the sacred shapes of the Universe. He places this structure over anything to be created, forming the blueprint of its construction. The major Earth’s ley lines follow the same pattern as the Metatronic Cube.